Kerens was incorporated in 1881. The Texas & St. Railway built a narrow gauge line through Navarro County and surveyed a townsite, which was named for an official with that railroad. Kerens is known as the “Birthplace of Big Tex” — although that’s not who he was when he started! You see him here in his original 1949 incarnation as Santa Claus. THE SYMBOL OF THE STATE FAIR OF TEXAS, Big Tex was born on the main street of Kerens. 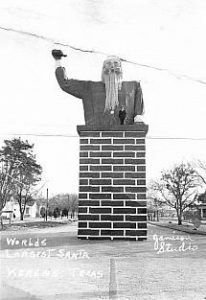 In 1949 the citizens of Kerens, under the leadership of the Chamber of Commerce, set about to build the world’s largest Santa Claus. For a couple of Christmas seasons the red-suited figure was the talk of the country. An enterprising Chamber official sold the metal framework to the State Fair of Texas where he has been ever since. During the centennial celebration in 1981, Big Tex came “home” for a week where he presided over the 100th birthday of Kerens.